So many things each day catch my attention and make me glad and grateful and thankful for this happy life of mine. Seeing, feeling, living, loving it all (well mostly loving it all :: Little Lady has not been well this week and I can't say I've been very cheerful about diarrhoea and pooy pants). Hmmm well moving swiftly onwards, here are the last couple of photos from the Cheerful stash :: dolly mixtures and sea glass. It'll be Mugs tomorrow, in case you had looked in here expecting Muggy pictures. Dolly Mixtures :: I had these sweets in the house a few weeks ago when I was decorating buns for Little Lady's birthday, and I just love the look of them. According to this brilliant website, dolly mixtures have been around since the 1920's, that's quite hard to get my head round actually, that they are so old! They're very pretty and sweet-looking aren't they, and so lovingly, nostalgically remembered from my own childhood when you still bought sweets by the quarter-pound in a paper bag. 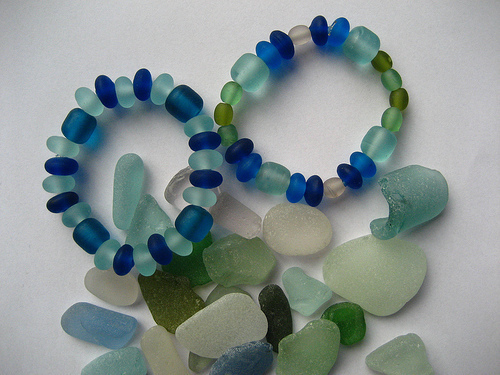 And on the subject of nostalgic childhood, isn't sea glass just the stuff of perfect childhood holidays? Hmm yes, and adult ones too come to think about it, I am addicted to searching for these jewels, I cannot help myself. I have been collecting sea-washed glass for as long as I can remember. I have this big glass jar full of it (and see a few prized, sea-washed marbles too) and I never come back from a visit to the coast without a few pieces in my pocket. To me it captures the essence of happy seaside holidays :: it's a jar of sea-coloured memories and it never, ever fails to please me. So imagine my absolute joy when I discovered these braclets a few years ago...they are not technically speaking made of sea glass but they look very much like it don't they? They are in fact ingeniously made from recycled glass bottles by a small company down in Cornwall called Greenglass. I just love this jewellery (I have a necklace too) and it attracts a lot of attention, especially from the Little People. And not just my Little People either, several of my friends' children love these bracelets when I wear them and beg to try them on, I think they are fascinated by the fact that the beads are made of glass which is usually a material out of bounds for children. Ahhh roll on August, we have a holiday cottage booked here and the teeny-tiny beach down at the harbour is a great hunting ground for sea glass jewels. Bring it on. 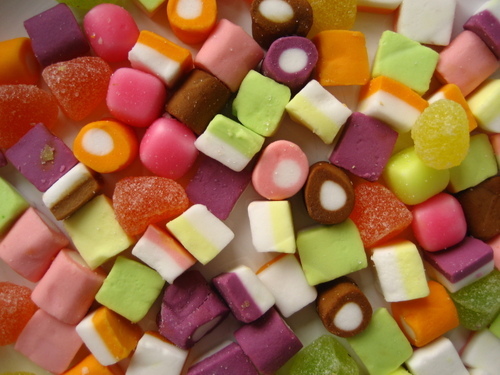 Dolly Mixtures just make me smile. I love sorting them out to decorate cakes with...or sometimes I just throw them with abandon on top of the cake. The jelly ones are my favourite. Hey there! I love your reasons to be cheerful. I know that things can sometimes be a bit overwhelming in life, but you've helped to remind me that we needn't search too far for the "Happy Little Things" - thanks again - cheers!! My mum made me a wonderful present one year. she collected lots of sea glass over some time and layered it in a rectangular clear glass vase, with darker pieces at the bottom right up to white at the top and it looks just like a wave. I love it. I love dolly mixtures! I like the cube shaped ones the best. With regards to sea glass, I have never found any no matter how hard I look!